In Seattle, the sun has been playing an elaborate game of hide and seek—one moment blissfully bright and warm, another moment behind a cloud, threatening torrential rain. With such unpredictable, un-summery, fickle behavior of our weather, I give you the recipe for the simplest, most delicious cauliflower you’ll ever taste. This versatile dish goes well with summery barbecue fare just as much as it does with cloudy-day stews and soups. The first time I discovered how mouth-wateringly scrumptious vegetables become when roasted in high heat, I was agog. 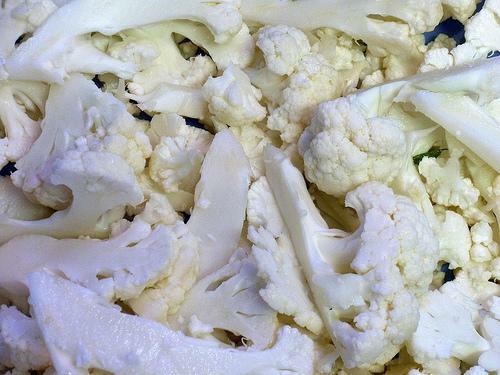 Where was the soggy, flavorless boiled or steamed cauliflower I had learned to detest as a kid? As my favorite veggie friend best put it, this roasted, toasted cauliflower “are transformed.” But let me assure you, there’s nothing mystical about this recipe—in fact, it could not be simpler, and when served with some equally simple brown rice (spiced with lemon and garlic, or cilantro and parmesan), could actually become quite the delicious light summer entrée. I grabbed the best quality olive oil I could find, some sea salt (table salt would substitute just as well, but I love the grainy mouthfeel of sea salt), black pepper, and a large mixing bowl. 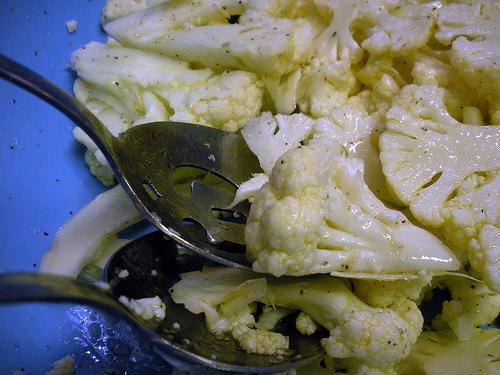 Green or white cauliflower both work well according to your preference. 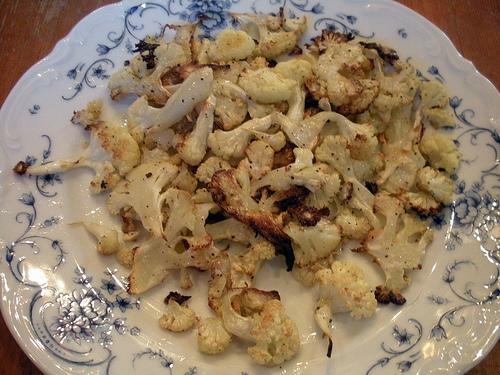 I only used half a head of cauliflower for two people, but oh goodness -- we devoured it in a minute flat. I highly recommend slicing up a whole head. You'll be glad you did. Slice the cauliflower top down, aiming for slices about a quarter inch thick. It's okay if pieces crumble over the cutting board. Push all your slices into the mixing bowl. Pour a generous amount of olive oil on top--I gave it two or three good glugs. 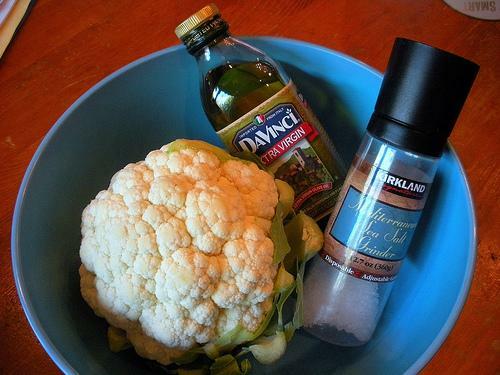 Salt and pepper to taste and toss with salad tongs or big spoons so all cauliflower is equally coated. Try to resist sampling! Spread out cauliflower in a single layer over one or two cookie sheets and roast 20-25 minutes in a very very hot oven (mine was 450 degrees, and I ended up wishing I had turned it up to 500 degrees for an even crispier result), turning once about halfway through your cooking time. Consume the delicious finished product gleefully. I fell in love with cauliflower so much by the end of this plate, I ended up putting more in my morning egg scramble. I still haven't recovered from the boiled cauliflower my Mum served to us as a child (which was even more revolting because I left it until last, so it was always cold too). Maybe I'll have to give this vegetable another chance. This doesn't sound too bad! Wonderful post, Anneka! I adore cauliflower, and now you've given me an ever better way to prepare it! Thanks, this looks divine! Try adding lemon juice and thinly sliced garlic - it's Fabulous! 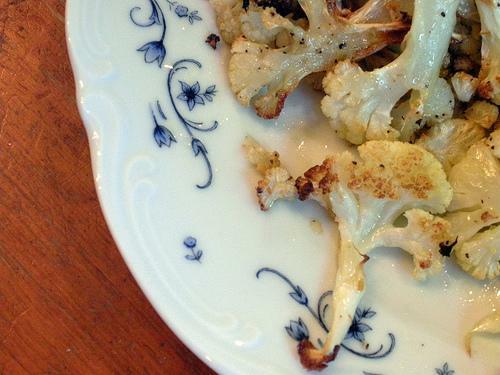 We love roasted cauliflower! When I have an abundance I will roast it (along with some onion and spices) and then puree it with veggie broth for a delicious "creamy" soup. My favorite little produce store had organic cauliflower on sale for 99 cents so I bought two - I think I'll be roasting them up! Thanks for swinging by my blog - love what you've got here, too!